Just a few weeks after the conclusion of the last edition of DRUPA 2016, Laem System / / Eutro Log are satisfied with their success during the fair. 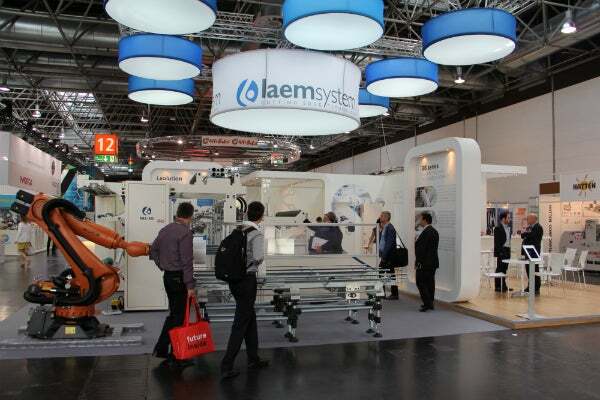 This year, the Laem System stand staged an international theatre of numerous key meetings. The company sold two machines in South America and opened several other significant projects to be developed over the next few months. During the 2016 exhibition they presented their dual shaft RB2 slitter machine. The RB series, composed of the dual shaft RB2 and the turret RB4, represents some of the company’s main sellers, such models are a must for the world of Converters. Although the RB category has become a spearhead company standard, having been trailed and tested, improved and approved over the years, it is also a series that is highly flexible both structurally and technically making it suitable for all types of customisation including a wide range of integrated processes and handling of delicate and atypical materials. The presence of a Kuka anthropomorphic robot and mini sequence of conveyors positioned next to the Laem slitter also aroused much curiosity, opening doors to projects in the other Laem System / / Eutro Log Business Lines. Customers were curious and intrigued by the possibilities to further control cycle times and improve productivity, aspects that play an essential role in the converting processes. These specifically designed ‘i-solutions’ include an array of finishing processes, material handling, wrapping, bagging, palletising, labelling, quality control and warehousing. They are completely flexible, individual and modular and can be integrated into any existing systems and structures, offering a fully automated world that many have yet to discover. The comments and feedback received from the visitors to the Laem System stand admired the co-existence of tradition and innovation, complimenting Laem on the desire for innovation and the continuous drive to create new, interesting and even exclusive solutions. A breath of fresh air. Still celebrating the success at DRUPA, the Team Laem System // Eutro Log is already busy preparing for the other important annual event, the K EXHIBITION, due to take place in October 2016, in Dusseldorf.